As you read in yesterday’s post I attended the I love Fashion Bloggers Q&A last Saturday. 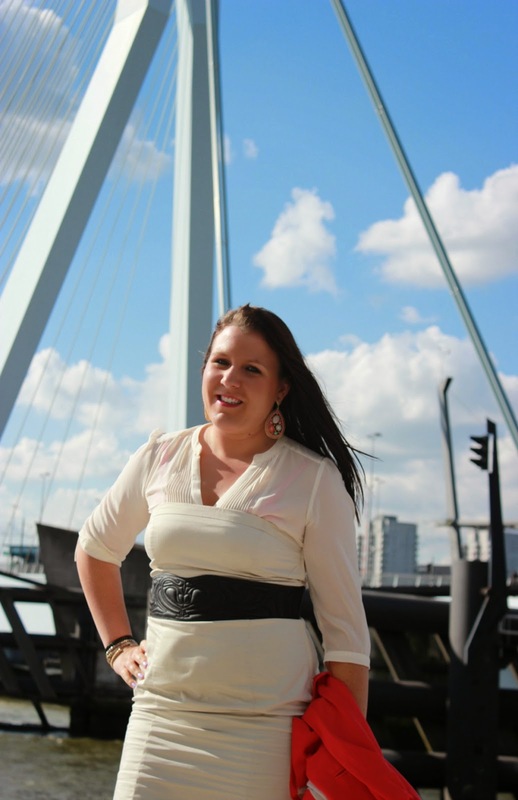 The event took place in the NHow hotel and this hotel had a lovely view on the “Nieuwe Maas” and the Erasmus bridge. Of course some outfit pictures needed to be taken. I mean how often do you find yourself in Rotterdam on this amazing location. I tried on a business yet ladylike outfit. In my opinion you can still see in the pictures how ill I have been all week. Do you like this outfit? Btw: a big thank you to Kevin for taking these pictures with his Canon camera. These pictures really remind me I HAVE to invest in a decent camera. Often my readers and friends ask me where I bought my clothes. I always mention the brands I’m wearing but sometimes the pieces are from a previous season so you might not find the exact same item. Therefore I found a solution for you. With every outfit post, I’ll give some alternatives. The great thing about this is that you can buy these item straight from my blog. leukste stad van nederland: Rotterdam! Leuke look trouwens. Mooi kleedje! Dankjewel Aurélie! Voor shoppen was er helaas geen tijd maar ik wil er zeker eens ooit terug gaan! Leuk al die foto's en mooi uitzicht he met die brug!! !